As mothers of young children, we spend an embarrassing amount of time at Chick-fil-A. From taking over their play area to sleeping in their parking lot, we’re there a TON. As in, we know the owner and many of the employees by name. And with a half dozen kids between us, we also know ALL the Chick Fil A money saving hacks for a large family. We know all the ways to cheapskate your way to a free lunch or two. And we are equal parts proud and embarrassed by these facts. 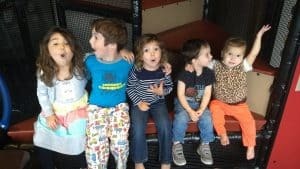 Even though it’s fast food, those dollars spent at Chick-fil-A add up quickly, especially when your kids keep growing and insist upon eating their own food. I keep a VERY tight cash budget, which means that I can only eat out with the kids about once a week- and that’s if I keep our total under $10 for the three of us. 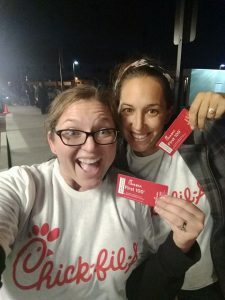 So how do I fuel our obsession with CFA while keeping our costs down? We’ve got a few Chick fil A money saving hacks for a large family (or a small one!) to help you make it work. This app is a total money saver. Every time you order, you can scan the app. Over time, your purchases will translate into free treats. Since they’ve updated the app, you can know see the points you earn for every dollar spent, and you get to choose how you spend those rewards. As a bonus, the app features mobile ordering, which helps your points add up faster. It also prevents you from having to wrestle the three angry possums masquerading as your children while standing in line. Some restaurants will sporadically add surprise treats to the app in order to entice customers to come in. We have three Chick-fil-A locations near us, and one of them performs better than the others (We’re looking at you, Long Beach Towne Center). You can use these treats at any CFA though, so select the restaurant that gives out the most treats and then use them wherever you please. This Chick-fil-A hack will get you absolutely free food on a regular basis, so it’s definitely one of our best tips. After you order, check out the bottom of your receipt. A couple of times a month, my receipt includes a link to a survey I can take in exchange for a free chicken sandwich. It takes all of five minutes, does a favor to my local Chick-fil-A, and can easily feed a kid or two on our next visit. There’s no limit on how many of these you can do, so if you’re lucky enough to get two survey invites in a row, you can complete them both and be swimming in sandwiches. If a Chick-fil-A happens to be opening near you (you can check here to see which cities will be getting a new location here! ), you could be in for the experience of a lifetime. If sleeping on the ground for free chicken is the kind of thing you’re into (spoiler alert: we are). The first 100 customers that enter a new CFA location receive a card that gets them 52 free meals to use over the course of the next year. And in case you’re wondering who is crazy enough to do that, the short answer is that we are, and you can read all about when we did it. This one largely depends on your family and their appetites, but we’ve split meals with our kids in all kinds of ways. 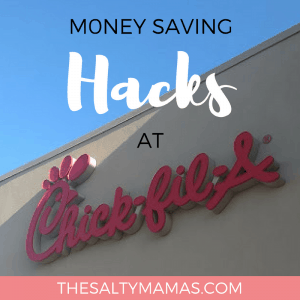 And if you need Chick Fil A money saving hacks for a large family– this one’s for you. Get a larger kids’ meal and split it between two kids. Get a 12 Count Adult Meal with a larger fry and divvy it up (you can do the same with a regular adult 8 count meal if your kids’ appetites are smaller). Sub the Nuggets in a kids` meal for a Chicken Sandwich (yep, you can do that!). Cut it into nugget-sized pieces and give each child a half of the bun. Split your free survey sandwich between the kids and buy a fry or fruit cup for them to split. You can buy an extra bun for 30 cents, which makes for a great snack for littler kids. For another 10 cents, they’ll even add a slice of cheese and now you’ve essentially got a grilled cheese. If your location offers a chicken nugget tray, order one! Get a couple of large fries and watch the savings add up (and watch your kids DEVOUR 30 chicken nuggets in no time at all). Okay, this one varies depending on location, but here’s what we’ve found- if you are at CFA at 10:30, when they stop serving breakfast and start serving lunch, they will often give away any of the breakfast items they can no longer sell. 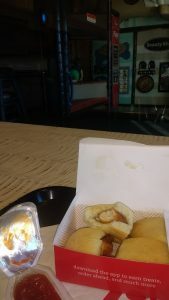 Sometimes they give items away when you order, and sometimes they’ll walk through the restaurant with a tray offering up biscuits or hashbrowns or even breakfast sandwiches. This doesn’t happen every time, and you definitely shouldn’t expect it, but when it does it can add up to a decent meal without a huge bill. Many of you already know that you can trade in your child’s toy for an ice cream when you visit. It’s a great way to extend the trip and add a sweet treat to your day. But there’s a couple of Chick Fil A hacks in this as well. First, you can exchange “old” toys for an ice cream, too. So if you run out of time to turn in your Flashlight toy, you can use it the next time you go, even if they’re onto books by then. Secondly, you don’t have to use these on the same visit. So if you desperately need to get your kids out of the house, you can take your unused kids’ meal toys to CFA, buy yourself a soda, and spend the afternoon playing and eating “free” ice cream. 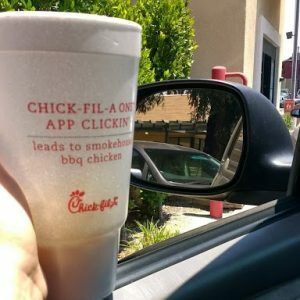 It’s a super cost-effective way to sneak in a few more visits to Chick-fil-A without the cost of a full meal. So download that app, do a survey or two, and get ready to split some chicken. Or milkshakes. Or a Frosted Sunrise. 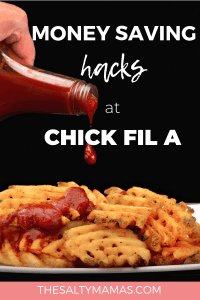 Whatever floats your boat, because using these Chick fil A hacks will have you SWIMMING in free items at your local CFA. What’s your favorite item at Chick-fil-A? Tell us in the comments below! Awesome tips. We go to CFA twice per week, sometimes more, so these will come in handy! The first one I learned was about trading the toy in for ice cream and I was like Whoah! No Way! lol. The toys are always pretty lame, but the ice cream rocks. Consistently on July tenth, you can score totally FREE Chick-fil-A course only to show up in your bovine group. Children will get a FREE Kids Meal (such an awesome complimentary gift!) One of the most-shared tips among mothers of little is that you can spare the toy that comes in the child suppers and exchange it in for a FREE Ice Dream treat.